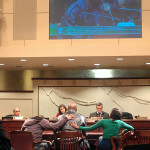 When approached by Fred Bryant (above), father of slain Keaton Dupree Otis, Consult Hardesty began diligently supporting Bryant’s attempts to get justice for his son, killed by an ‘anti-gang unit.’ We organized for his testimony to be heard by Federal investigators, and supported Bryant in his appearances before Portland authorities (right). We helped him prepare logistically and programmatically to participate at a national convening of survivors of police violence. Our involvement was more extensive than indicated in this survey of elements of a social justice campaign. Our relationship became more deeply personal than we could have ever imagined. A depiction of direct action allows us to share part of our analysis. (More complete backstory here.) Other campaign elements follow, below. July 2013 – still from Hart Noecker, Antiphon Films. Click the image for video coverage. 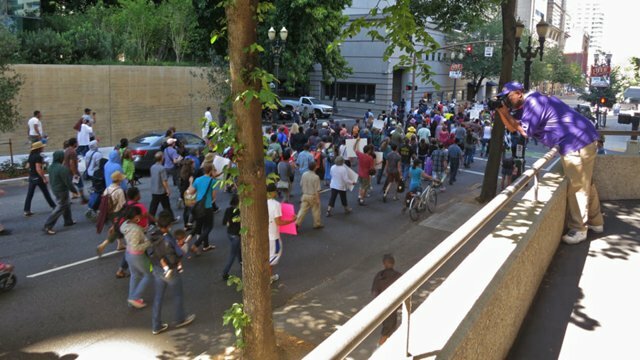 On 20 July 2013, Jo Ann Hardesty helped organize and lead Portland, Oregon umbrage after Florida prosecutors were unable to bring a conviction in the killing of Trayvon Martin. The police homicide of Keaton Dupree Otis had prepared our community: we learned in 2010 that racial profiling brings lethal consequences to some. In her speech, Jo Ann referenced page 84 of the OIR Report. City consultants reviewed public records and officer statements in the Otis homicide. We contend their re-reporting of police depictions failed in any helpful analysis. Their condensation of police accounts is revealing, however. Like the Martin case, Otis was observed wearing a hoodie. As in the Portland Police homicide of James Jahar Perez (who represented the third 2003 killing of an unarmed African American in Portland), the victim was operating a car deemed inappropriate for such a driver. In the Otis case, consultants documented officer observations of bad posture, and evil glances. They reported an officer declaring Otis “looked like he could be a gangster.” We know there are no quantifiable assessment tools for gang designations. We understand officers were merely giving their perception that Otis was black. At this point we have descended into the absurd. It’s shocking that the consultants aren’t shocked. The OIR report seems the product of dutiful typists, refusing to embrace the implications of what they’ve copied and pasted. Three years after the inciting homicide, OIR presented cooked-up rationalizations … and not deep analysis of actual police conduct. Had they integrity, better skills and some independence from city employers, it seems quite plausible that consultants would have reported differently on the same set of facts. “Wearing a hoodie, slouching, driving a car above his station in life, ‘mean looks’ and thinking bad thoughts are not indicators of criminal conduct in a community that has been over-policed for decades. Mr. Otis was not breaking the law. He is alleged to have committed a traffic infraction after being targeted by a police agency known to engage in excessive force. 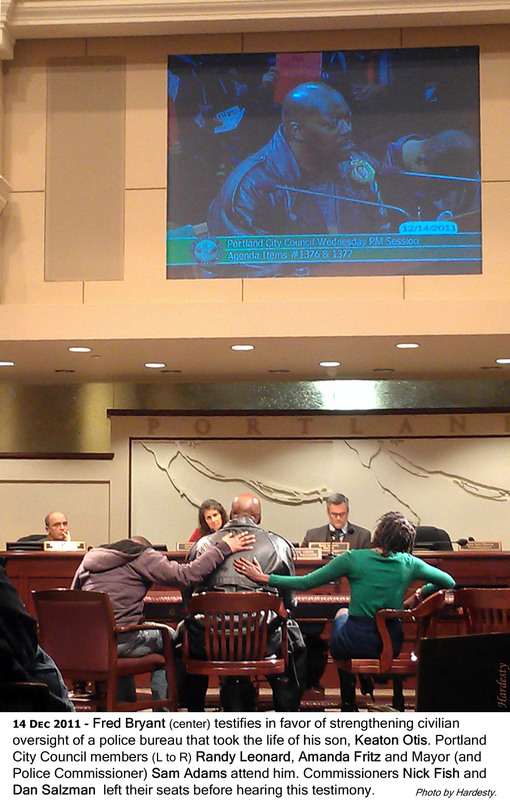 OIR concluded by reiterating – and holding as effective – public reliance on an Independent Police Review Board. In contrast, the DoJ, Civil Rights Division, after an actual investigation, termed IPR a ‘self-defeating accountability system’ (page 27). We combine direct action with more staid pursuit of seeking legislative change. 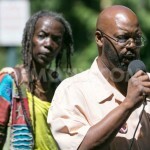 Consult Hardesty has taken a comprehensive approach to multi-jurisdictional flaws that allow racial profiling to fester. We initiate public dialogue to inform community members about faulty information which leads to poor policy implementation. Having been actively involved in the development and adoption of a Police Plan to Address Racial Profiling, we know it’s main provisions have never been implemented. Feet on the ground, we bring to the conversation cogent arguments that consultants – reading the paper trail from a distance – will never arrive at. What follows are tools – beyond testimony and galvanizing public opinion – that we’ve employed while pursuing justice in the death of Keaton Dupree Otis. We connected Bryant with film producers, so that his story would be documented. We designed and implemented an action plan, depicted by this site, and intended to facilitate a core team of activists. The working group was to organize and support advocates willing to represent for Keaton Otis and his deceased father in a Federal hearing. Consult Hardesty collaborated on the design and messaging of David Whitfield’s pamphlet, employed to pressure Oregon’s governor to use state resources to address the un-investigated police homicide. We designed and produced this media release, for Keaton’s sibling, to call attention to her participation in a national convening. NOTE: The local CBS affiliate changed their messaging after Jo Ann and Bryant spoke in 2013: they no longer reported Otis had fired a weapon, only that an officer was shot. 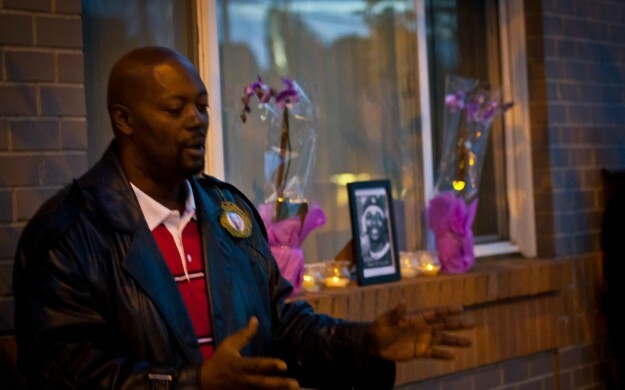 David Sarasohn, a managing editor at the Oregonian made a pithy comment: “Before you get to the readiness to fire, you have to start with the readiness to follow.” We take him to mean an inclination toward pursuit based on racial profiling preceded the homicides of both Martin and Keaton Otis.